Beaux’s portraits were highly sought out by Philadelphia’s wealthy and elite. Many distinguished Philadelphians were also her friends, such as Ethel Page (Mrs. James Large), whose family traced its lineage to Roger Williams, the founder and governor of Rhode Island. The two women met in 1876, and Beaux painted her portrait many times using various techniques and styles that she developed and favored over the years. This pastel portrait has affinities with the elegance, informality, and dramatic brushwork seen in the society portraits of John Singer Sargent. Beaux’s novel composition envelops her sitter in softness and atmosphere, reaffirming the warmth and familiarity they shared. George Burnham was chief financial officer of Philadelphia’s Baldwin Locomotive Works and a prominent member of the First Swedenborgian Church. 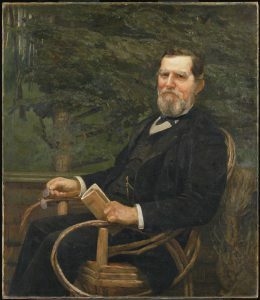 In the summer of 1886 he asked Beaux to come to his summer home in Lake George, New York, to paint a portrait of him. 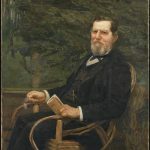 The sitter’s attire, demeanor, and attributes such as the gold pocket watch, glasses, and book, all point to a man of wealth, dignity and learning. Beaux enlivens the somber palette with glints of sunshine on the face, rustic rocker, and birch trees, presaging her en plein air (outdoor) studies in France a year later. After successful studies in Paris and the coast of France, and a few commissions in England, Beaux returned to Philadelphia in 1889. In this self-portrait, Beaux eschewed the superficial trappings of a traditional portrait, preferring to present her essence as a mature, confident woman. While her face is in focus, her body is only suggested, and the background is nothing more than loosely constructed brushstrokes. The primacy of the brushwork may allude to her profession as a painter. This work is experimental in nature and belies the professional standing she was achieving as the pre-eminent portraitist in Philadelphia. Simultaneously she was exhibiting widely across the country, winning prizes and medals. In 1895 she “consented” to teach a Head Class and portraiture at the Pennsylvania Academy of the Fine Arts, becoming the first full-time woman instructor and confirming her importance in the art world. Founded in 1805 by painter and scientist Charles Willson Peale and other civic-minded Philadelphians, the Pennsylvania Academy of the Fine Arts was originally housed in the American Theater at Tenth and Chestnut Streets. In 1876 the Academy moved to a new building designed by Frank Furness and George W. Hewitt at Broad and Cherry streets (depicted at left). It was designated a National Historic Landmark in 1975. Beginning in 1844, the Academy’s Board of Directors approved the use of gallery space by female students three times a week. This decision led to an increased presence of women in many roles. 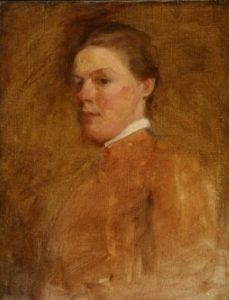 Though they exerted influence behind the scenes, it was not until 1878 that Catherine Drinker became the first woman to teach at the academy and nearly another twenty years before Cecilia Beaux, who had studied there, was asked to become a full-time instructor. The Academy was unique in that it became the earliest school to allow women to study in classes, a more progressive stance than in Europe, where women were refused admission to official art academies. In addition to its art school, the Academy houses a museum, which presents the work of faculty and alumni as well as established and avant-garde contemporary artists. Pieces are continuously added to the collection, and the Academy maintains a balance between historic, modern, contemporary art. The elegant portraits of Cecilia Beaux (1855-1942) found unanimous critical acclaim in Philadelphia, Paris, and New York. Her modern style of painting combined the best of academic training, European sophistication, and experimentation. Beaux successfully negotiated the gender separatism of the late nineteenth century while she gained international renown, allowing her to become the first full-time woman instructor at the Pennsylvania Academy of the Fine Arts. 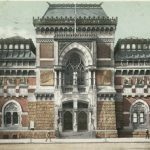 Beaux’s maternal relatives taught her how to copy lithographs and took her to exhibitions at the premier art venue in the city, the Pennsylvania Academy of the Fine Arts (PAFA), as part of their tutoring. Cecilia was raised by her grandmother Cecilia Kent Leavitt and her aunt Emily and uncle William Biddle after the early death of her mother Cecilia Kent Leavitt Beaux (1822-55) and the return of her inconsolable father Jean Adolphe Beaux (1810-84) to France. Culture was a priority; relatives arranged tours of the private art collections of John S. Phillips (1800-76) and Henry C. Gibson (1830-91) and that were later donated to PAFA in 1876 and 1892, respectively. 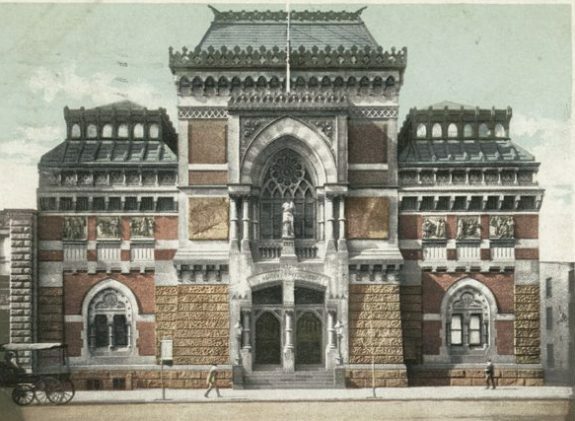 Beaux’s art instruction began in the Walnut Street studio of Catherine Drinker (1841-1922), a distant relative and later the first part-time woman instructor at PAFA. She then continued in the school of Francis Adolf Van Der Wielen (active in Philadelphia 1870-74). By 1874 Beaux began teaching. Self-directed and ambitious, Beaux sought further professional training at PAFA from 1876 to 1878. She took antique, portrait, and costume classes there, but did not join Thomas Eakins’s notorious figure painting classes. In her autobiography she explained her resistance to the magnetic Eakins: “A curious instinct of self-preservation kept me outside the magic circle.” Instead she turned to Eakins’s less-controversial protégé, William Sartain (1843-1924), for instruction in painting the live model. In the midst of her academic training, she produced fossil drawings on commission from the U.S. Geological Survey (1877–79). After just one month at Piton’s Art School (1879), she obtained commissions for children’s portraits on china, much in vogue at the time. That same year she began her lifelong practice of exhibiting portraits at PAFA. Throughout her career, Philadelphia family and friends were essential to Beaux’s evolution as a portraitist. Her first major essay in oil was The Last Days of Infancy (1883-84), a double portrait of her sister Ernesta Beaux Drinker (1852-1939) and her nephew Henry S. Drinker Jr. (1880-1965). Beaux layered the informal scene with psychological and emotional overtones that transcended the formal influences of James A.M. Whistler (1834-1903) and Sartain. Exhibited to critical acclaim in New York, Philadelphia, and Paris, it won the academy’s Mary Smith Prize for the best work by a local woman artist. 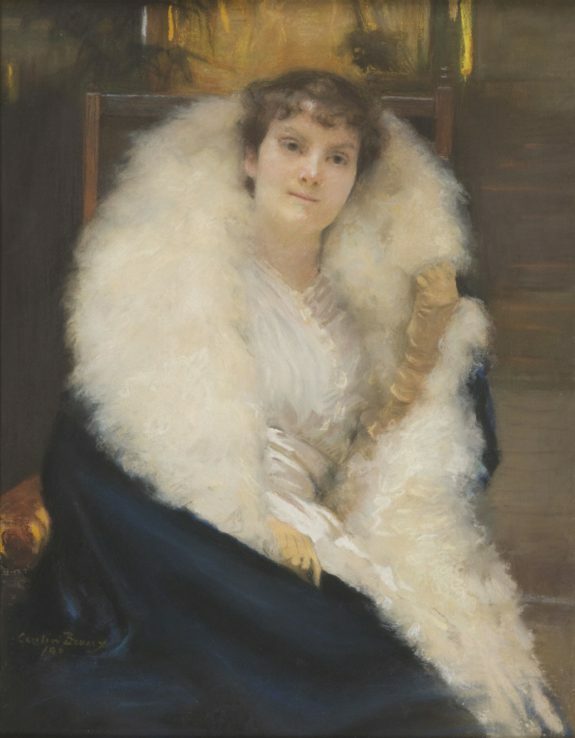 This distinction launched her career locally where there was a constant demand for portraiture, a Philadelphia tradition among old wealth, civic organizations, and the aspiring commercial class. Though not raised in a wealthy household, Beaux identified herself and was identified with the well-bred, cultured, and moneyed elite, who were interconnected through clubs, church, marriages, and business. In quick succession she painted the Reverends Chauncey Giles (1813-93) and William Henry Furness (1802-96); businessmen George Burnham (1817-1912), George M. Troutman (1811-1901), and Frances Drexel Paul (1852-92); and lawyer John Cadwalader (1843-1925). Illustrious families, anxious to extend their legacy, also commissioned portraits of their children. Beaux went to study in the ateliers of Paris and on the coast of France from 1888 to 1889, widening her repertoire and techniques and absorbing new ways of seeing color and light while working en plein air. On a visit to Cambridge, England, she reunited with an old Philadelphia friend, Maud DuPuy Darwin (1861-1947), whose connections led to a few commissions, enhancing the artist’s recognition abroad. Though there were viable options for continued professional success in Europe, Beaux returned to Philadelphia in 1889. During the next decade her portrait practice thrived. In her best oeuvre from that period there was an intricate mix of precise craftsmanship, up-to-the-moment style, and a feeling of spiritual kinship with her sitter, as in Sita and Sarita, 1893 (Sarah A. Leavitt (1868-1930). With increased confidence she traveled and exhibited in New York, Chicago, Atlanta, Paris, and Boston, winning numerous prizes and medals. In Philadelphia she garnered three more Smith Prizes, the Gold Medal of Honor at PAFA, and a gold medal from the Art Club of Philadelphia. One of her most lauded paintings of Philadelphia’s Quaker upper crust was Mother and Daughter, 1898, a portrait of Mrs. Clement A. Griscom (1840-1923) and Frances Canby Griscom (1879-1973). Beaux created a dramatic statement of expectation and pride in partaking of certain social and cultural rituals, to which she added focused lighting and dazzling brushwork. In 1895 Beaux began to teach portraiture at PAFA, becoming the school’s first full-time woman instructor and confirming her importance in the city’s art world. She established a winter studio apartment in New York and built a summer studio home in Gloucester, Massachusetts, from which her social and professional spheres expanded immeasurably. She never severed her ties to Philadelphia, family, and PAFA, where she continued to teach until 1915, and was in constant demand as a juror at the annual exhibitions. 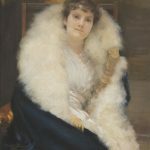 One of her staunchest advocates was Harrison Morris (1856-1948), managing director of PAFA from 1892 to 1905, who helped her maintain her status as Philadelphia’s preeminent portraitist. After the turn of the century, Beaux’s sitters included a distinguished array of international figures such as President Theodore Roosevelt (1858-1919) and French Premier Georges Clemenceau (1841-1929), yet she took equal delight in painting local acquaintances and family, especially her niece Ernesta (Aimee Ernesta Drinker Barlow, 1892-1981). Beaux’s feminist alliance with independent career women was conveyed through the serious demeanor seen in portraits of local activists Eliza Sproat Turner (1826-1903) and Marion Reilly (1897-1928), dean of Bryn Mawr College. Beaux’s prolific painting career was curtailed by a fall in 1924. Unbreakable in spirit and energy, she penned her autobiography Background with Figures, in which fond reminiscences indicate that Philadelphia remained the emotional root of her multi-blossomed life. Considered by many “the greatest woman painter alive,” she was often compared to John Singer Sargent, the leading society portraitist. Her reputation far exceeded her phenomenal local success; she was named by Good Housekeeping “one of America’s most distinguished living women,” and she served the international community as an artistic ambassador. Cynthia Haveson Veloric, M.A., is a research assistant in the American Art Department at the Philadelphia Museum of Art. She has recently published articles on Augustus Saint-Gaudens, Alexander Stirling Calder, Hutchings California Magazine, and Martin Johnson Heade. Beaux, Cecilia. Background with Figures: Autobiography of Cecilia Beaux. Boston: Houghton Mifflin Company, 1930. Burns, Sarah. “Under the Skin: Reconsidering Cecilia Beaux and John Singer Sargent.” Pennsylvania Magazine of History and Biography 124.3 (July 2000): 317-47. Carter, Alice A. Cecilia Beaux: A Modern Painter in the Gilded Age. New York: Rizzoli, 2005. Pennsylvania Academy of the Fine Arts. Cecilia Beaux: Portrait of an Artist: an Exhibition Organized by the Pennsylvania Academy of the Fine Arts in Cooperation with Museum of the Philadelphia Civic Center, Philadelphia, Pennsylvania, Indianapolis Museum of Art, Indianapolis, Indiana, 1974-1975. Philadelphia: Pennsylvania Academy of the Fine Arts, 1974. Tappert, Tara L. Cecilia Beaux and the Art of Portraiture. Washington, D.C.: Published for the National Portrait Gallery by the Smithsonian Institution Press, 1995. __________. “Choices: The Life and Career of Cecilia Beaux: A Professional Biography.” Ph.D. diss., George Washington University, 1990. 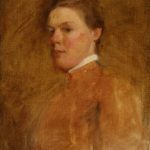 “William Sartain and Cecilia Beaux — Influences of a Teacher.” In Philadelphia’s Cultural Landscape: The Sartain Family Legacy. Philadelphia: Temple University Press, 2000. Toohey, Jeanette M. “Intricacies and Interdependencies”: Cecilia Beaux and the Pennsylvania Academy of the Fine Arts.” Pennsylvania Magazine of History and Biography 124.3 (July 2000): 349-74. Yount, Sylvia. Cecilia Beaux: American Figure Painter. Atlanta: High Museum of Art, 2007. Cecilia Beaux Papers and Tappert Collection of Cecilia Beaux Research Materials, Pennsylvania Academy of the Fine Arts Archives, 118-128 N. Broad Street, Philadelphia. Cecilia Beaux Papers, American Academy of Arts and Letters Library, New York, N.Y.
Cecilia Beaux Papers, Archives of American Art, Smithsonian Institution, Washington, D.C.
Pennsylvania Academy of the Fine Arts, 118-128 N. Broad Street, Philadelphia. Bryn Mawr College, Art and Artifact Collections (Portrait of Marion Reilly, 1918), Bryn Mawr, Pa.
Philadelphia Masonic Temple, Library, and Museum (Portrait of Peter Williamson, 1891), 1 N. Broad Street, Philadelphia. First Unitarian Church, Parish Room (Portrait of the Reverend Doctor William Henry Furness, 1886), 2125 Chestnut Street, Philadelphia. Cecilia Beaux grave, West Laurel Hill Cemetery, Bala Cynwyd, Pa.